A cold drizzle fell on the streets of Bend as I left the car. Expecting the light spattering of rain to turn to falling snow at any minute I eagerly reached for the handle to Boneyard Beer. Small and humble the Boneyard taproom sported a short bar and modest standing room. Chop shop tools decorated the walls and vintage beer cans lined shelves and windowsills. A small cast iron stove gave off a warm glow erasing the chill brought in from outside. Originally an old auto shop, Boneyard retained much of that same feel. I met Kristen Ortiz, Boneyard’s Taproom Queen behind the bar. She smiled, greeting me from under a red knit hat. Boneyard’s tasting room offered beers to-go and $1 tasters. Kristen hooked me up with the whole run-down of Boneyard’s menu. Excitedly putting down my first two tasters in front of me she went on to describe Boneyard’s planned expansion. “We’re a small operation now, so we’re psyched to be growing.” she leaned against the bar as she spoke. The new 15,000 sq ft facility would expand on the demand for production. No plans for a full taproom yet but it would give Boneyard the opportunity to crank out more of their popular brews. “Its awesome that the whole barrel system is secondhand, too.” Kristen added. This aspect kept with Boneyard Beer’s whole philosophy. From its beginnings in 2010, owner Tony Lawrence assembled his dream brewery from a “boneyard” of used equipment. Refurbishing pieces from 13 different breweries from around the country, Tony put it all together and Boneyard Beer was born. With the help of increased production Boneyard would soon be capable of cranking out up to 45,000 barrels a year. “This next one is one of my favorites and definitely our most popular.” Kristen said, putting another taster down on the bar. Utilizing 6 different hop varieties from the Pacific Northwest, RPM IPA is without a doubt Boneyard’s best seller. Despite the level of hops used in each batch the beer is well balanced and not overly bitter. Rounded out with a complex malt backbone it’s easy to see why it’s so popular. In a state with stiff craft beer competition, RPM won the honor of People’s Choice Best Beer in Oregon in December 2015. Backbone is a delicious collaboration with local coffee roasters, Backporch Coffee. Espresso and chocolate combine to make a wonderfully creamy stout. Smooth and rich, it is the perfect beer to drink around an Oregonian campfire. Femme Fatale is Boneyard’s signature sour. Fermented with heaps of fresh raspberries this ale is deep red in color, medium balanced, and highly drinkable. Not super tart, it is perfect for someone looking to get their feet wet in the world of sours. 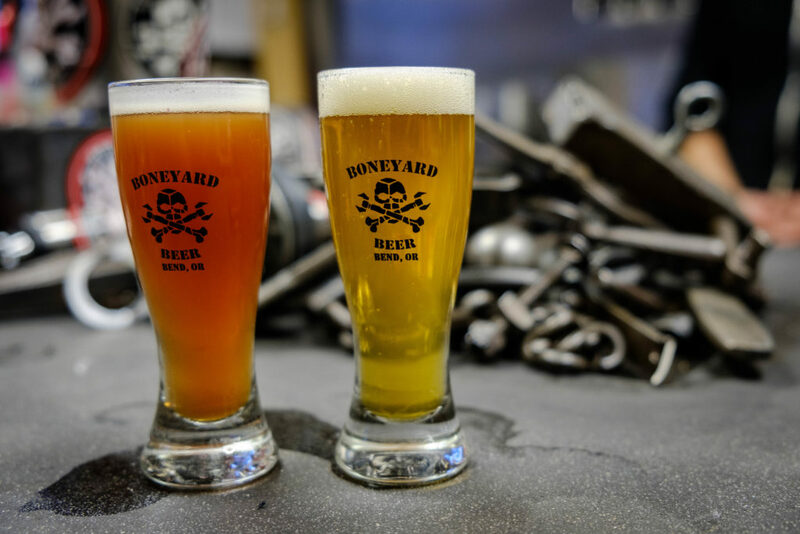 Answering the call from their California neighbors to the south, Russian River Brewing Company, Boneyard has joined over 60 breweries around the country to cook up its own batch of Sonoma Pride. 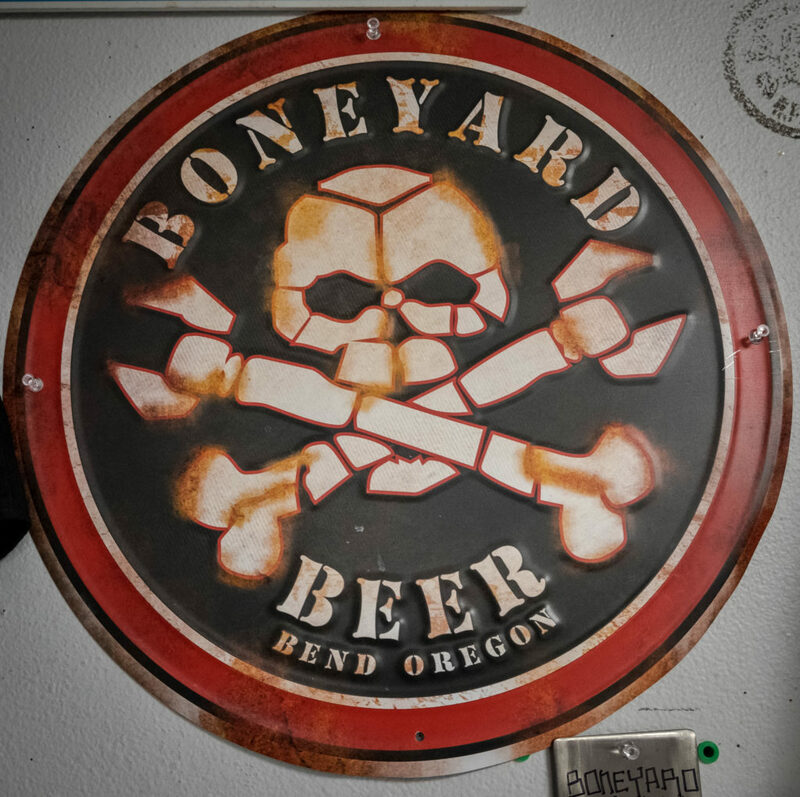 A sessionable pale brewed with Amarillo, Simcoe, and Zeus hops, Boneyard’s version of Sonoma Pride is light, crisp and refreshing with just the right amount of hoppy kick to make it an all day drinker. Best of all, revenue generated from Sonoma Pride goes directly to those impacted by the recent wildfires that devastated Northern California. As I continued sipping on Boneyard’s lineup and chatted with Kristen more folks began to filter in. A local from across town, another a guy on vacation from across the country. The small intimate setting helped encourage customers to socialize with each other. Soon, we were all engaged in conversation that centered around a shared love of beer. Finishing up my last taster and saying goodbye to Kristen I stepped back out into the Oregon chill. In one of the biggest states for craft beer it was great to see a brewery that was so steadfastly focused on what mattered. Their efforts of pooling their money and resources into beer production and wisely investing on refurbishing old equipment has paid off. The cozy tasting room helped bring everything together. Boneyard proves that you don’t need a big flashy taproom or entertainment laden patio to create a good beer experience. All you really needed was just good beer.